This recipe comes to me via a convoluted path. It’s a Marcella Hazan recipe, posted on Thursday Night Smackdown by Claudia, the blogger behind Cook Eat FRET. Wherever it came from, it’s a magnificent recipe. This is really just an old Italian way of cooking a chicken breast stuffed with some pancetta and sage, but it’s exactly that simplicity that makes it successful. Firstly, the chicken is important. You’ve got to have good quality chicken breasts for this, free range at the least. If your chicken is from the poultry morgue in the local supermarket and looks a) really white, b) freakishly large, c) cheap and d) generally unhappy, it’s probably best not to make this dish. Take a chicken breast and either follow these instructions on how to cut it up properly, or take note of Claudia’s stress levels and just slice it horizontally in half so that you’ve got two pieces, one larger than the other. I cut just under the faux fillet and took some of the main breast muscle with it. Next, cover with clingfilm and batter the chicken with a meat hammer or something heavy until it’s flat. Season well. 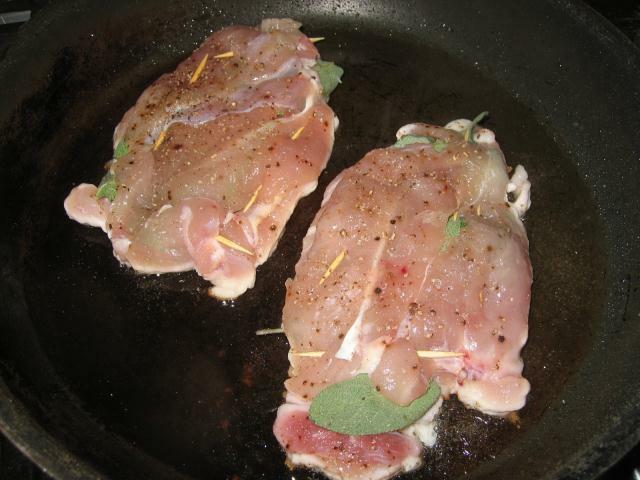 Arrange some pancetta (streaky bacon would do the same job) on top of the larger fillet and add sage leaves. Use the other piece of chicken to make a sandwich and secure it all together with some toothpicks. I think my chicken benefited from a brief stay in the fridge at this point. Heat some olive oil and butter in a big frying pan until hot, adding some more sage leaves. Gently cook the chicken for about 6 minutes on each side until cooked through and crisp. Set aside on a warm plate. Pour off some of the fat from the pan and deglaze with some white wine, scraping all the chickeny goodness into the wine. Allow to reduce by at least half, check the seasoning and add a small knob of butter to give the sauce a glossy coat. Put the chicken back in the pan and turn to coat thoroughly. 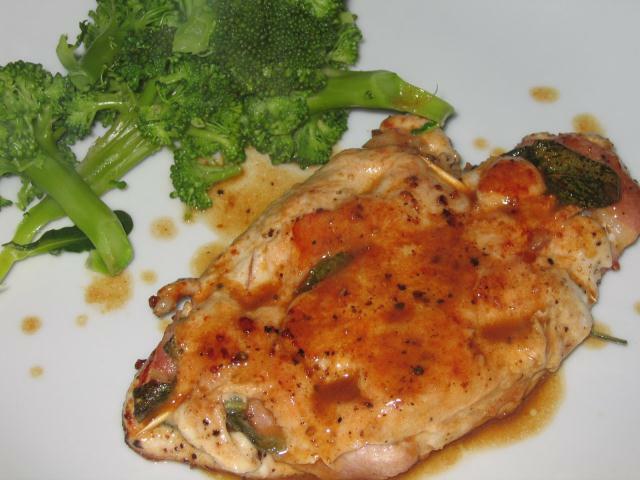 Serve with broccoli or other greens, and maybe some crusty bread. Go read Thursday Night Smackdown and Cook Eat FRET – both excellent blogs.